The B3P can be found on Amazon for about $50-$60. As is, it's NOT approvable for the Mercs without a few needed modifications that will solve that issue in this tutorial. First, you need to determine if you're going to keep the clear visor attatched to the helmet. It would certainly be easier to glue the opaque visor behind it but understand that it might be harder to clean as a result. If you are keeping the clear visor, cover it with masking tape before doing anything. If you wish to remove the visor, be advised the plastic is EXTREMELY brittle and will break and shatter providing very rough cuts. 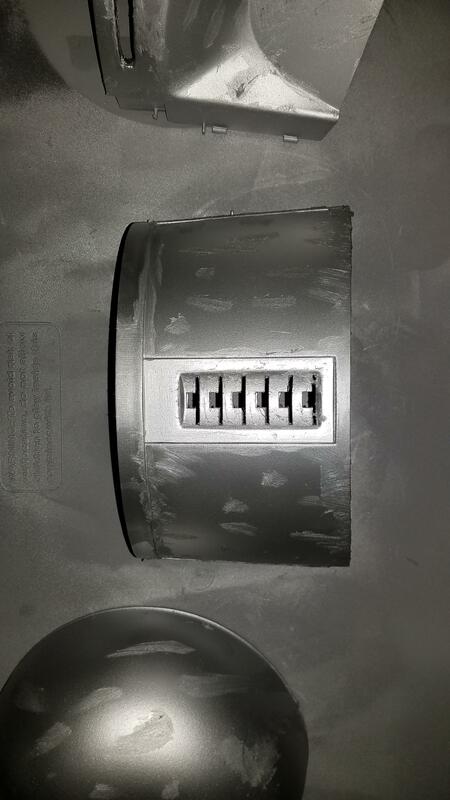 This is where you would take your dremel with a drill bit and used the drill bit to cut out the clear plastic. Once cut, attatch a sanding drum to your rotary tool and sand down the edges. Use a sanding cone for the small "T" tip ends of the visor where your eye level is. 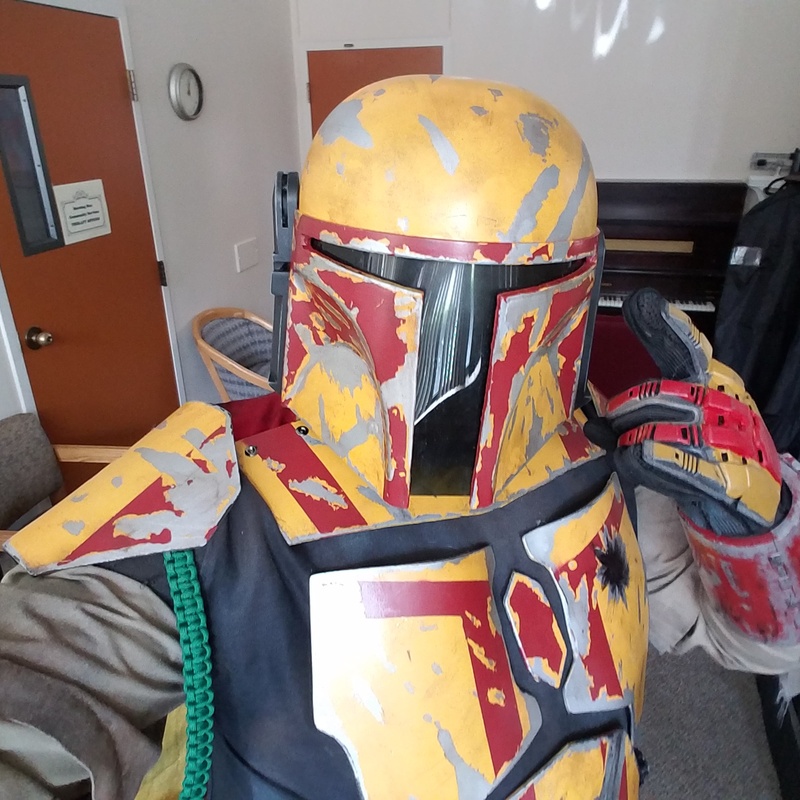 Once your visor situation is taken care of, now is time to fill your Boba dent. Disassemble your helmet by popping off all your ear cap pieces and separating all three major helmet pieces. 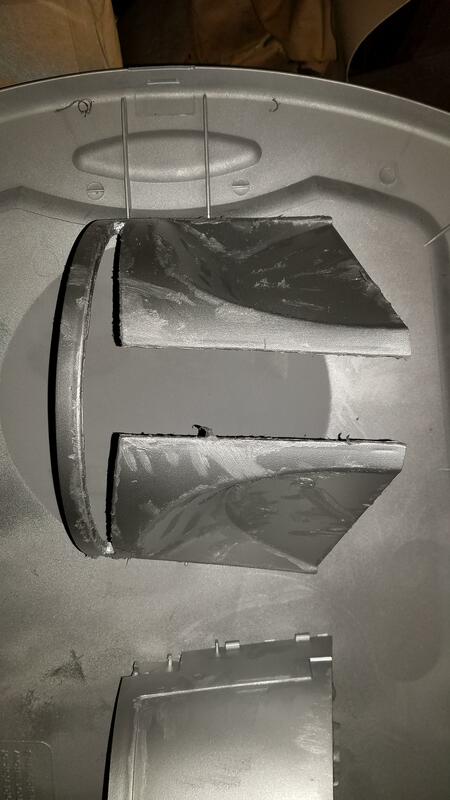 Bondo is comprised of two pieces, the grey filler puddy and red hardener. The more hardener you apply, the quicker the bondo hardens. 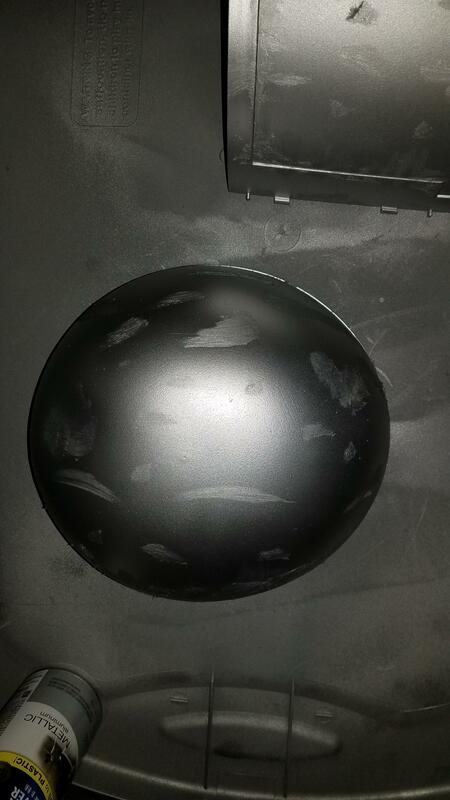 Mix your bondo and hardener onto a disposable container or surface and liberally apply it over the dent. Let set over night. 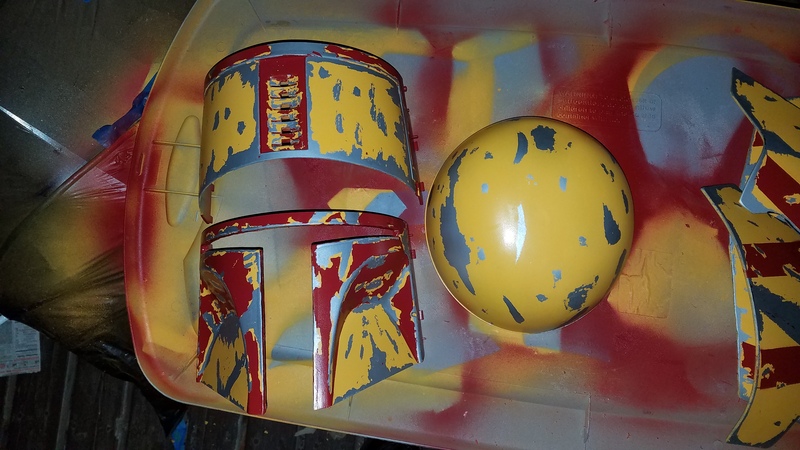 Picture was from another helmet project. 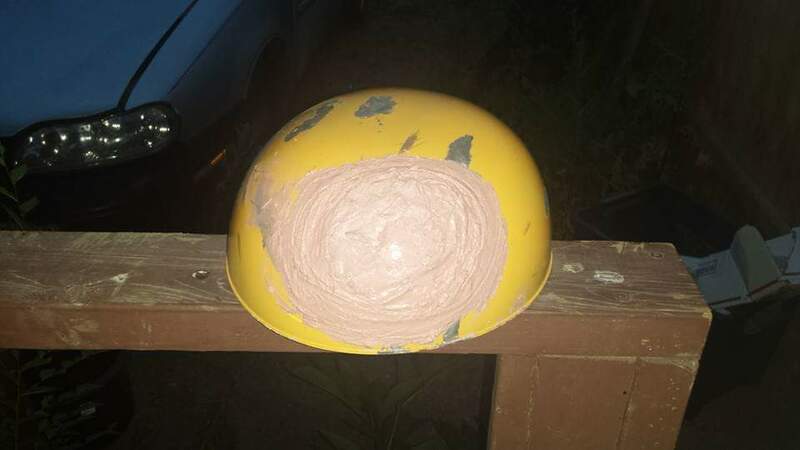 Take your low grit sand paper and sand the bondo down and switch to a high/extra high grit sand paper to sand it down into the surface of the dome. 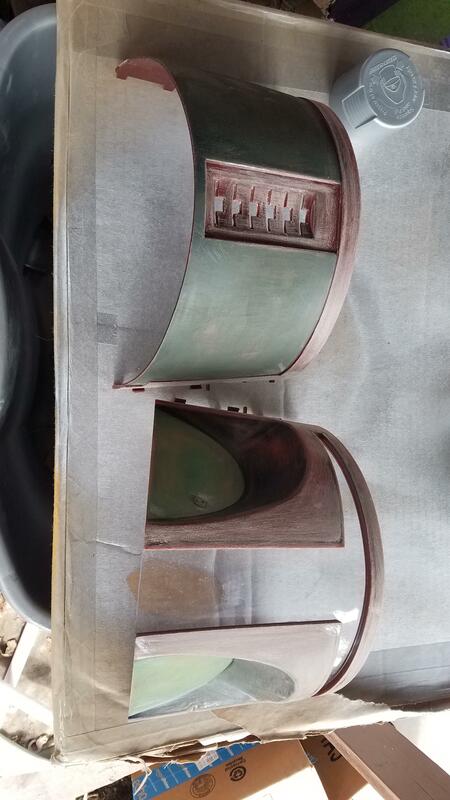 Take a new sheet of high/extra high grit sand paper and sand down the whole helmet so that your primer will adhere better to the plastic. After you sand your helmet, wash all the pieces in cold water and dry them off with a towel. From there, start priming. 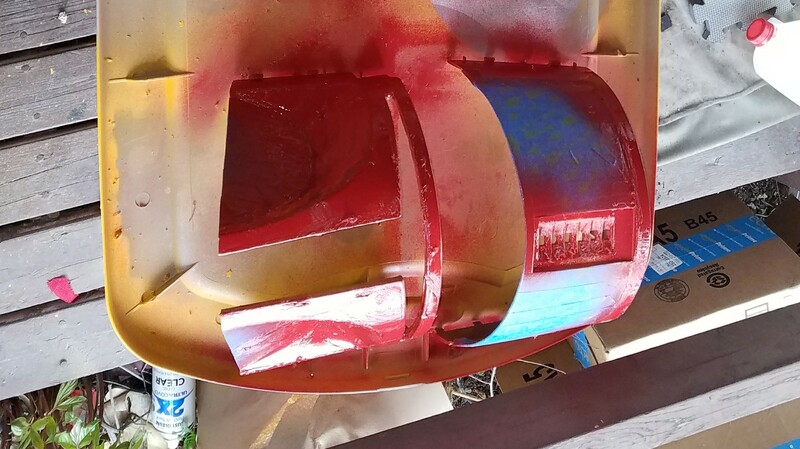 I used Rustoleum 2 in 1 automotive sandable primer and filler for literally what's written on the label; if you find your filled area is uneven, you can sand it down more. It'll also fill any imperfections like unwanted scuffs, and as a primer I find it to be very durable and paint bonds to it VERY well. Keep your primer spray about 8-12 inches away from the surface and spray in a vertical/horizontal motion. REMEMBER, keep your spray paint moving to avoid pooling. Add light coats every 15-20 minutes until you have a solid layer of primer. It took me roughly 4 light coats. Then let it dry for 24 hours. Now that you've let your primer dry. It's time to add some color to your bucket. If you plan to use more than one color for your helmet, make sure all your paints are the same brand. Different companies use different components to make their paint and some of them do not mix well with others. I used Rustoleum brand paint. For those of you that live in humid regions, I highly recommend this brand because it's more resistant to moisture. Like you did when you primed your helmet, apply light coats every 15-20 minutes keeping your spray nozzle 8-12 inches away from the surface. Once you have a solid layer of color, let it dry for 24 hrs. It's important to note that it doesn't matter what color comes first: primary or secondary. I decided to put the primary color (gold) on first for simple instructions. Once you've let your paint dry, rub off the Vaseline with a dry cloth or paper towel. Feel free leave the Vaseline where you plan to put your secondary colors alone until you've painted again. 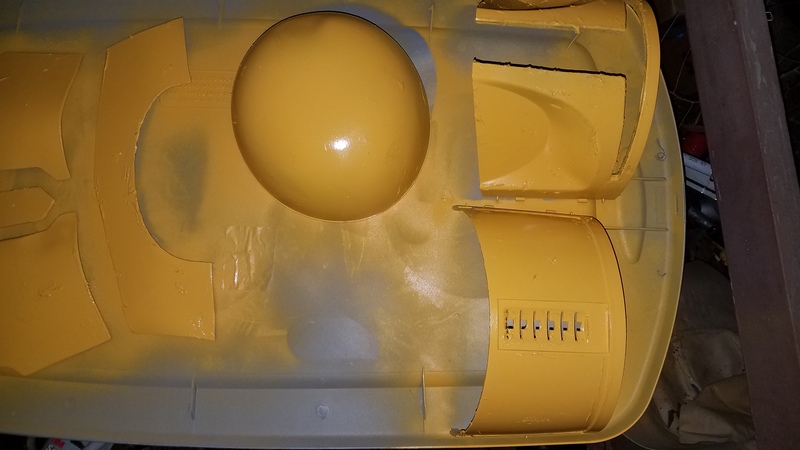 If you want to add some depth, go ahead and rub them off and reapply some Vaseline over the original spots you rubbed off (it does not have to be perfect, but stay as close to the original weathering pattern as possible). After you've left your first color dry, move on to prepping for your next color. Use your masking tape to block off any areas you do not want painted. When applying tape, put it on as straight as possible. Over lap each strip of tape with another, do not try to conserve by spreading it out. Both aforementioned techniques will help prevent paint from bleeding through. 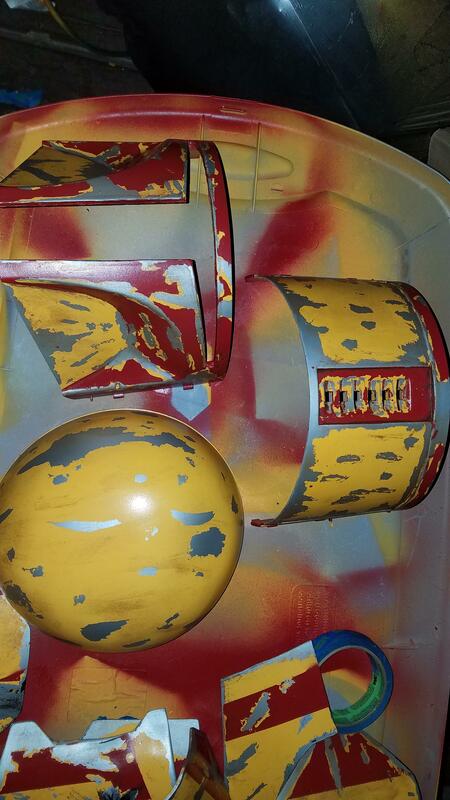 Once you've covered the areas you don't want painted and you've double checked your tape work, begin painting. Again, light coats: 15-20 minutes, spray 8-12 inches away moving your spray in a horizontal/vertical pattern. Let dry for 24 hours. Repeat the process with additional colors if any. This part is completely optional. 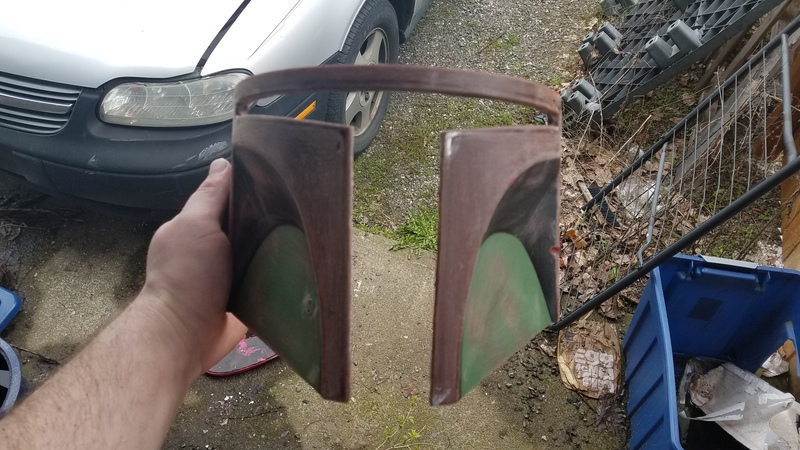 After you're done painting and scuffing off your paint, take some black and brown acrylic with a paint brush and dab/brush random areas of your armor in varying sizes and amounts. Then quickly take a paper towel and wipe off the excess paint while it's still wet, other wise use a wet towel to remove the excess and a dry towel to dry it up. If you plan on doing this in segments (which is recommended) repeat the process on each part of the helmet until satisfied. 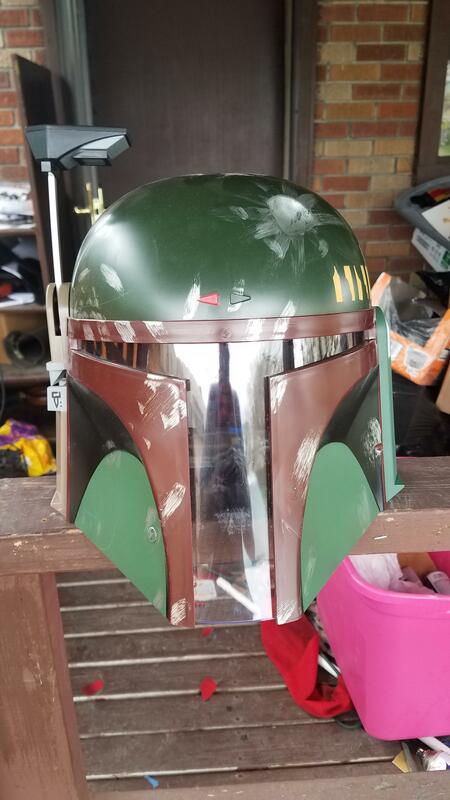 Once your weathering and painting is complete, take a clear finish to your helmet as if you are painting it again (because you essentially are). 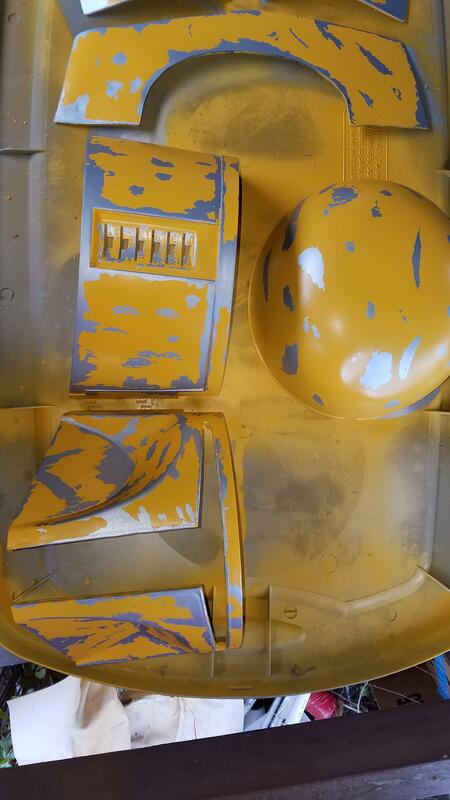 Once you've painted every component, piece your helmet back together. Cover the inside seams inside the helmet with a glue gun to keep them from separation. Before you put the range finder ear cap back on, you'll need to do one thing: remove the original range finder and stock. It does not meat to CRL standards. If you wish to lengthen it, feel free. Just know that removing it is easier for beginners. Take a Philips Head screw driver and unscrew all the screws to separate both halves of the ear cap from each other and pop out the range finder. Put the ear cap back together and snap it to its place on the helmet. I highly recommend gluing the ear cap in conjuction with snapping it back on to keep from falling out and to reinforce the helmet. 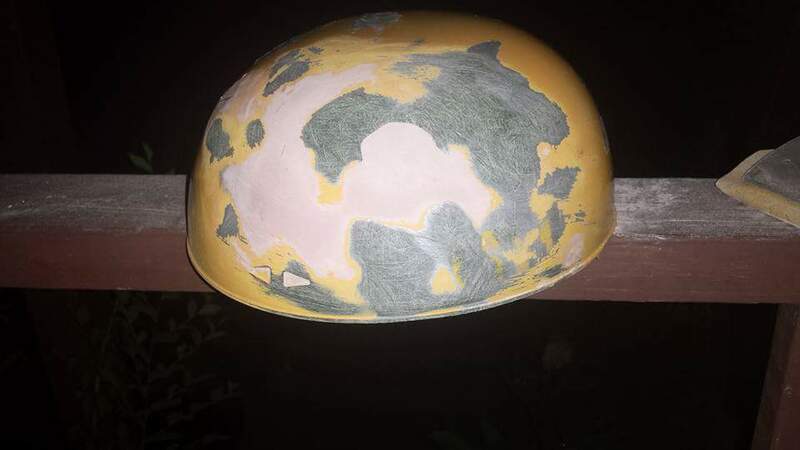 You can further reinforce the helmet by applying fiberglass all over the inside of the helmet. But what I did was take two sheets of 2" W by 3" L 3mm Sintra and glued them over the side seams inside the helmet. 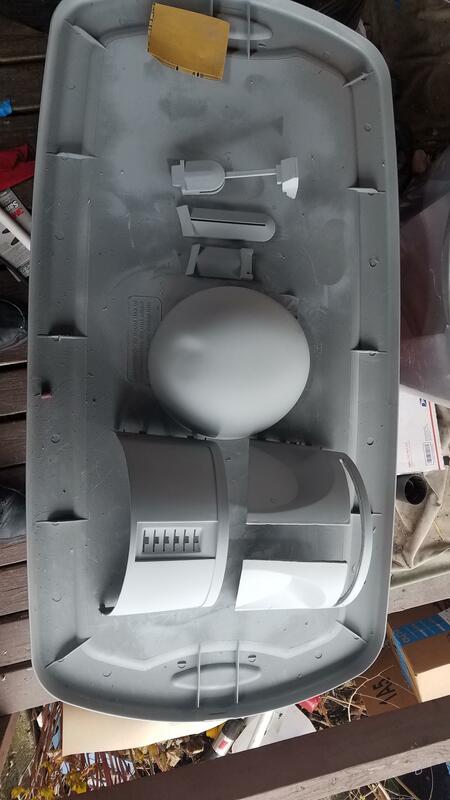 You can also use a similar technique with the dome but I just pasted the dome to the mask with E-6000 contact cement. Weather you've left the original visor on or off does not matter. You need to install an opaque dark visor. First, measure your T Visor frame from end of one end of the T to another, the length of the T from top to bottom and the T column from side to side. Take those measurements and widen the pattern by at least a half inch. Do not match your pattern to precise measurements. Then, take your template and trace it on an dark opaque face shield and cut it out. The face shield is soft enough to use a tough pair of scissors. Next, take a hot glue gun and glue the edge of your visor to the inside of the helmet. For a snug fit, hot glue the spongey yellow foam inside.